Pep Guardiola said the Premier League title race would have been over if his Manchester City side had lost to Liverpool on Thursday but a 2-1 victory closed the gap at the top to four points and reinvigorated the club after recent defeats. 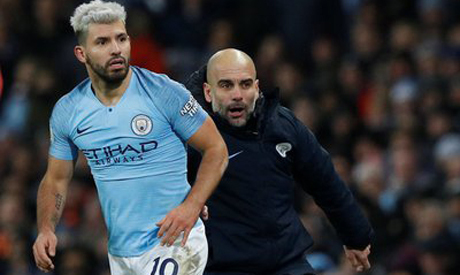 In a match that lived up to its billing played in a wonderful atmosphere at the Etihad Stadium, Sergio Aguero put City ahead with a brilliant strike and, after Roberto Firmino had equalised, Leroy Sane inflicted Liverpool's first defeat of the season with a low shot off the post in the 72nd minute. "Losing today, it was almost done," Guardiola told reporters. "Ten points, with goal difference 11 points, so difficult to be honest to turn that situation, but now we are four points behind them. "We have to fight a lot but four points is enough to be calm and it is a good moment to congratulate and say thank you to these incredible players. Today they show how good they are, they played against an incredible team. "It was a good spectacle and both teams played to win. It was a final for us because lose and it was almost over. Now is tight again." "It was important we played with courage," Guardiola said. "We were so aggressive in our pressing as we knew how complicated it was and we know how incredibly fast they are when they get in behind - so dangerous. "It was a huge compliment for him to play in this position that's not usual for him," he said. "He made an incredible effort against these strikers. Centre back and captain Vincent Kompany said: "I'm not even worried about the result I’m absolutely buzzing with a tremendous performance. We went toe to toe with a very physical, very aggressive team and we matched them if not more. "The performance was beyond anything I’ve ever witnessed today. It came from the gut, the 12th man is more than just the fans, it’s a desire, something from within you can’t describe and today it was there and we are a better team when we play with emotion." "I thought it was a great challenge, was it not? I got the ball, a bit of the man, I didn’t try to injure him that’s for sure," said the Belgian. "It was that or either let him go through on goal. The decision was made very quickly in my head."